Long-time Tripawds members may have noticed things are awfully quiet around here lately. Unfortunately, the crickets may be getting louder. That’s because Google hates Tripawds.com. Let us explain. You will notice that Tripawds.com rarely ranks high in search results anymore. We used to be listed as one of the top three links in Google and in multiple pages thereafter. But no longer, thanks to various algorithims used for ranking search results (aka “Google PageSpeed Standards“). Tripawds results get buried by Google. This isn’t the first time Google has penalized websites with algorithim changes. Previously, they required websites to be more mobile friendly, so we addressed that issue. Later, they required us to implement more secure access to the site, so we took care of that too. Now, Google is penalizing websites for taking “too long” to load in web browsers. Exactly what is too long, according to Google? Well, certain pages at Tripawds can take to six to ten seconds to load content capable of interaction by users. But now Google developers have made it so that the highest ranking search results are given to pages that load in milliseconds – regardless of of whether or not that page content is outdated or even helpful. 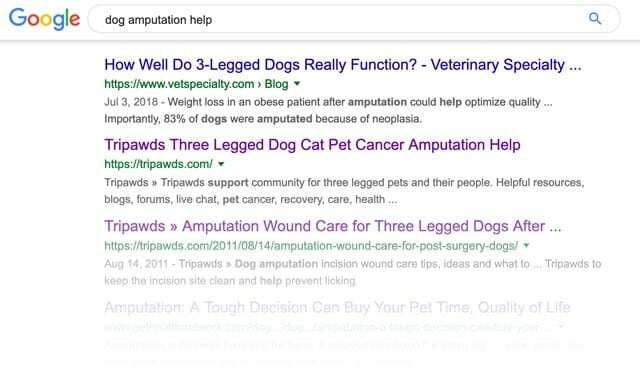 As a result, many of the most helpful resources available at Tripawds.com (like our Discussion Forums) are now buried deep in the dark corners of the internet, since Google owns over 90% of all search engine traffic. Sadly, fixing this issue is more complicated than plugging into faster hardware. Meanwhile, less informative, much older and outdated web pages and articles are out-ranking us. This is why our forums have been eerily quiet over the last month. New members cannot find us. 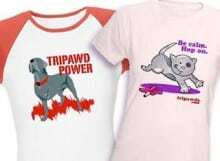 Our traffic has dropped to unprecedented lows, and so have Tripawds Gear sales and commissions that help support our community. Awareness of Tripawds Foundation assistance programs and vital donations to keep them going are likely to follow. As soon as we discovered this was happening, Admin Guy began frantically working long hours to address this situation. He is continuously doing his best to improve site speeds. In geek speak, he is: minfying scripts, eliminating render blocking resources, optimizing server performance, compressing images, and much more. Whew! The sad truth is, certain resources will likely have to go if we are ever to compete with Google PageSpeed standards. The stylish design, photo galleries, live chats, discussion forums, random widgets and rotating banners all impact our search results now. This massive animal amputee support community we have lovingly built from the ground up for the last twelve years, will undergo dramatic changes if we are to survive. 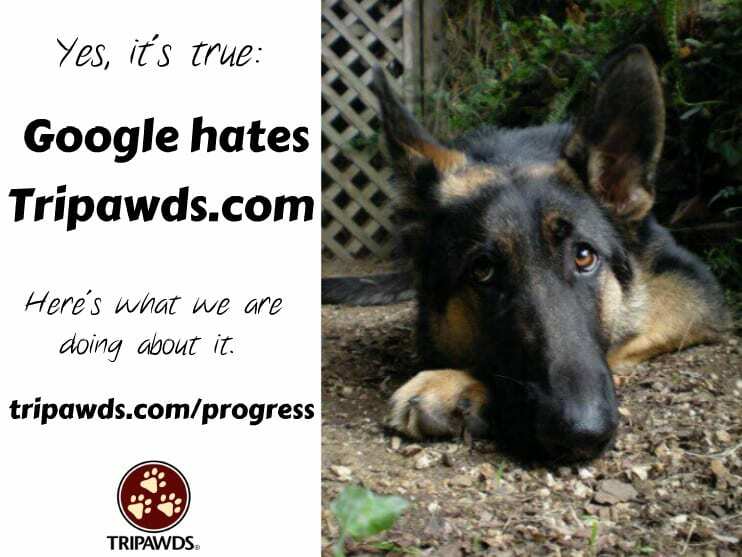 Keeping the Google monster happy means we must strip Tripawds.com resources and design down to a bare bones format, focusing on information and functionality. Many of the bells and whistles added over the years may disappear. Of course, the Tripawds Discussion Forums will remain, though some of its additional features may be removed. For a sense of the time and money involved in the overhaul required, professional website development firms have provided project estimates to us that range from $17,000 to $70,000. Yep, our two person operation with one do-it-all website administrator has built a valuable content-rich, feature laden resource that would cost that much for anyone else to create. So unless we win the lotto, we cannot pay this kind of money and must continue to address these issues ourselves. We are not asking for donations for this situation. We would prefer that any contributions go to Tripawds Foundation so our programs can remain. Admin Guy is stuck with the job, and that’s all there is to it. His primary goal will be to improve PageSpeed ranking, which in turn should help improve search engine results. As he identifies specific deliverables others may be able to assist with, contractors will be hired – with no funds coming from the Foundation. So, be prepared to see some changes coming soon. Changes in Google algorithims are hurting Tripawds everywhere. This complicated Tripawds.com de-construction will cost us more time, effort, and money than we ever anticipated spending on website development at one time. This is time and money that we personally don’t have, because we spend most of our work days dedicated to this labor of love that doesn’t even come close to paying what a California McDonald’s worker earns. We will need to take on extra freelance graphic design and writing work to pay the bills, which delays a fix for this problem. As our Internet presence remains buried, Google’s search engine tactics hurt us financially, but more importantly Google is hurting pet parents the most, at a time when they desperately need our many free resources. We must get the Tripawds name out into the veterinary community and keep it there. The more vets who refer clients to the blogs and forums, the better. Engage in the Tripawds Discussion Forums and share your stories in your own Tripawds blog. Show the people who do find us that you care and are ready to help. Plus the more activity throughout our network, the better chance that other search engines will continue ranking us highly in search results. Share your blog posts on social media. If you have a Tripawds Blog, your posts are shared to the Tripawds Facebook page automatically. Help spread the word by sharing your posts in your news feed or other groups. Request a stack of free Tripawds Foundation brochures for your veterinary clinic. Share your story about how Tripawds has helped you on veterinary websites and Facebook pages. 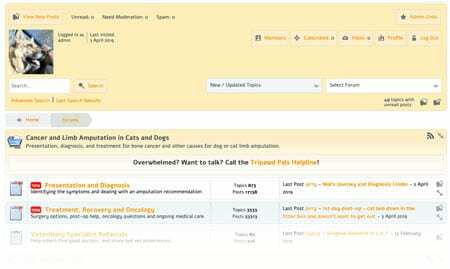 Ask veterinary clinics and anyone you know in the veterinary field to include Tripawds.com as a resource on their website. The more of these “backlinks” we have on respected websites, the better. If you’ve read this far, we are grateful for your attention span. In a world where ten seconds is too slow for the average search engine user, your dedication to our community is a breath of fresh air. We promise to keep you apprised of the situation as we have more to report. Thank you for all you do to help Tripawds everywhere.